The statement forms that are shipped with MoneyWorks allow you to print both open-item and balance forward statements. Most are designed to print on plain paper or letterhead. 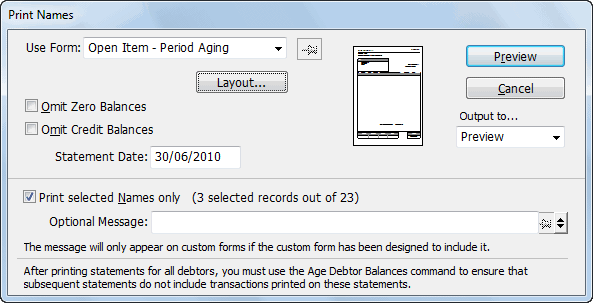 You can print statements for all debtors, or just selected debtors. If no individual debtors are highlighted, or if the Names list is not open, statements will be prepared for all debtors in your system. Choose Command>Print Statements or press Ctrl-]/⌘-]. The statement dialog box appears. Set any options that may be appropriate. For emailing, the Mail Attachment window opens — see Emailing Forms for more information. Include Remittance Advice: This is only available for the “Plain” statements. If set, a remittance advice will be printed at the end of the statement. Omit Zero Balances: Set this option if you do not want to print statements for debtors with zero balances. Omit Credit Balances: Set this option if you do not want to print statements for debtors with credit balances. Statement Date: Normally the cut-off date for new invoices—invoices dated after this will not be shown on the statement. But does depend on how the statement form was designed. Note: After you have successfully printed statements for all your debtors you should age the balances for the debtors. This will maintain the ages balances in the debtor’s Name record. If this is not done, the next time you print statements the same transactions may appear again (together with any new invoices or receipts).